A retrospective first published in Kathimerini 20 December 2006 about Paddy and Joan’s very good friend, the reknowned artist Nikos Ghikas. If one was to name the one element that pervades the work of the distinguished Greek painter Nikos Hadzikyriakos-Ghikas (1906-1994) throughout its course, it would probably be light. Much has been written about the Cubist-inspired aspect of his work, yet the luminosity and the radiance of Mediterranean light is what will mostly strike the visitor to “Nikos Hadzikyriakos-Ghikas: The Apollonian – The Dionysian,” a large retrospective exhibition of the artist’s work which is curated by his friend art historian Dora Iliopoulou-Rogan and is being held at the Pireos annex of the Benaki Museum on the occasion of the centenary anniversary of the artist’s birth. For an artist who perhaps more than anything else painted the Greek landscape – its essence and not its surface – this is perhaps to be expected. “Ghikas seeks light and the truth,” Henry Miller – one of the artist’s friends – wrote in his novel “The Colossus of Maroussi.” As an artist of the so-called “Thirties Generation,” Ghikas revealed the essence of “Greekness,” the archetypal notions that were believed to pervade the entire civilization of Greece. Harmony and light were two of them. Light and its reflection are among the elements that, according to the exhibition’s curator, link the Apollonian and the Dionysiac aspects of the artist’s work, the tectonic, geometric paintings and the more expressionistic, free compositions of labyrinthine, swirling shapes. “When they say that in my painting I have many different periods, I answer what Ingres said when he was told the same thing. ‘I have sir, many paintbrushes,’” Ghikas once said. Accordingly, instead of examining the work of Ghikas in terms of distinctive stylistic traits which lead from one to the next, Rogan examines the work of Ghikas as an undivided whole, as both Apollonian and Dionysiac, intellectual and emotional at the same time, as equally contained as it is extroverted. This is a new approach to the work of Ghikas which the exhibition’s curator presents in a voluminous book (of the same title as the exhibition) published by Livanis. A well-designed publication (the book helps counterbalance the effect of a dense yet slightly disorderly exhibition), it is a thorough, fully illustrated book that includes earlier published texts on Ghikas’s work, essays by Kimon Friar, Henry Miller, Christian Zervos and Patrick Leigh Fermor among them. It also unfolds the work of Ghikas across different media: Painting is the focus, yet sculpture, photography and the artist’s work for theater and costume design help show what Rogan has called Huomo universalis, an artist whose work was too broad in scope to fit into a single category and an intellectual – he was also professor of freehand drawing at the National Technical University – who wrote about the art and culture of different civilizations. Ghikas was as equally deft in line as he was in color. In the exhibition, an entire section presents just a fragment of the hundreds of drawings that Ghikas made. Among them a series of sensual nudes. There are also studies that Ghikas made for set and costume design and drawings that are the artist’s visual memoirs of his travels around the world. Ghikas was one of the few truly cosmopolitan Greek artists, a man who not only traveled the world but who was part of an international artistic milieu from early on. The only son of Alexandros Hadzikyriakos, an officer in the Greek Royal Navy, he was educated in Paris (this included his final school years) where, at the age of 21, he had his first solo exhibition prefaced by the well-known critic Maurice Raynal. 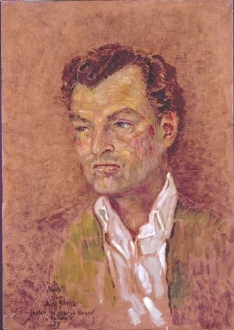 Ghikas’s involvement in the artistic and intellectual elite of Paris in the interwar period (he was friends with Henri Laurens, Fernard Leger, Georges Braque and Henri Matisse and became associated with Le Corbusier, Hans Arp and many others), helped to bring many intellectuals into contact with Greek art and culture. It was largely thanks to Ghikas that the 4th International Congress on Modern Architecture (CIAM IV) was held in Athens instead of Moscow in 1933. During that period, Ghikas worked intensively in Hydra, the island of his family home (which was later destroyed in a fire), and became inspired by its landscape, light and architecture. In later years, Corfu, where Ghikas and his second wife Barbara Warner had a summer home, also inspired the artist. None of those landscapes are identifiable. They are semi-abstract renditions that capture a mood and atmosphere, structure and light rather than any realistic description. In many paintings, the Greek landscape is combined with subjects taken from mythology. The work of Ghikas is filled with the tranquility and harmony of the Mediterranean, the resonance of Greek art and history. Ghikas appreciated everything that was Greek but was also deeply curious and sensitive to other, non-Western cultures. He had the open-mindedness of a cosmopolitan, refined man and was one of the few Greek artists to have been recognized internationally. In 1987, the same year that he was elected honorary member of the Royal Academy of Arts in London, Ghikas donated his work and home on Kriezotou Street in Kolonaki to the Benaki Museum. Held as an expression of appreciation on the part of the Benaki to Ghikas, the retrospective exhibition is also a tribute to one of the most esteemed modern Greek artists. “Nikos Hadzikyriakos-Ghikas: The Apollonian – The Dionysian,” at the Pireos annex of the Benaki Museum (138 Pireos & Andronikou, 210.345.3111) through January 15. This entry was posted in Paddy's Friends and tagged artist, Athens, Greece, Nikos Ghika, Nikos Hadzikyriakos-Ghikas on December 2, 2012 by proverbs6to10.